So, summer is definitely in full swing around here. I can tell because my hair has doubled in volume. Summer is a pretty fantastic time of year. The sun stays up late, the beach is an awesome place to be, and my freezer seems to have a never ending supply of ice blocks, mmmm. But lets face it, there are some downsides. Other than my super ‘voluminous’ hair, the worst part about summer for me are that insects, bugs, spiders, you name it!… all seem to come out of hiding. And over the past few years I have discovered that most bug sprays and other preventative measures flare up my asthma symptoms. So I turned to the internet to help me find a natural way to create my own insect repellant spray. This entry was posted in DIY, Health and tagged DIY, essential oils, health, insects, remedies, repellent, spray, summer. Almost 8 days into the new year… am I too late to the ‘new-year-new-me’ discussion? I’ve been on an extremely wonderful and eventful hiatus for the past three weeks, but since I’ve returned home (I was on holiday, in case I’m not making any sense) I can’t seem to get my brain to catch up to 2015. For instance – I went back to work this week and, oh boy, it all just felt way too soon. This entry was posted in Wellbeing and tagged champagne, goals, hiatus, holiday, new year, panna cotta, strawberries. So, a few weeks ago Priceline had a 40% all cosmetics sale. Needless to say, I had to check it out. However! I decided to only pick myself up a select few things because I’m heading to the states in a few weeks, where I’ll have my pick of a lot of the brands Priceline has to offer for a much more affordable price! So lets get started with some swatches and mini-reviews of each product I bought! This entry was posted in Beauty and tagged Australis, beauty, Essence, haul, makeup, Priceline, review, Rimmel, Sally Hansen. A huge part of Christmas for me (and I’m sure many others!) are the traditions. Almost three years ago I spent my first Christmas away from Mum & Dad, and while I had a great (hot) Aussie Christmas with my extended family – it just didn’t feel the same! It was almost as if Christmas didn’t happen that year. This year I am fortunate enough to be flying overseas to spend Christmas with my family, which I hope will be steeped in our usual traditions! My biggest Christmas tradition is baking – a lot of it! I absolutely love to bake, but I don’t do it too much throughout the year. Christmas is when I go nuts, and it’s when I relish in creating yummy treats the most. I have my most cherished recipes that I make every year, but I always like to try something new to shake it up a bit. I want to share with you two dessert treats I can’t wait to make this year. This first one is from Not Martha, and its her take on gingerbread houses. 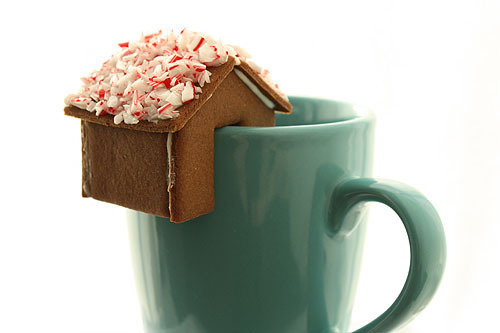 These are small gingerbread houses that sit on the side of your mug! I have actually made these a few Christmases ago, but I have not a single photo to prove it. So, you’d best believe that I’ll be making some of these cuties this year. Possible in Shortbread form – we’ll see. This next recipe has become an absolute classic part of my Christmas, and it is Nigella Lawson’s Chocolate Pistachio Fudge recipe. Enjoy these recipes everyone. I’ll be writing more posts in the near future with my own creations featured. This entry was posted in DIY, Food and tagged baking, Christmas, cooking, fudge, gingerbread, traditions.